Heron Park play structure after swing removal. Photo credit: Richard Van Winkle. The City of Mill Creek removed the swings at Heron Park due to multiple safety concerns reported by city staff during a February 2018 inspection. The city council may approve a replacement solution in the 2019-2020 Capital Improvement Plan. Heron Park is a popular park with community members. Residents who were young children when the park was built are now eager for their children to enjoy the park as well. In February, Mill Creek Public Works crew members whom are Certified Playground Safety Inspectors completed an inspection of the Heron Park play structures. Their evaluation was based on safety guidelines outlined in the current U.S. Consumer Product Safety Commission Public Playground Safety Handbook. This handbook addresses public playground equipment for use by children 6 months through 12 years. Since its first edition in 1981, the handbook has been regularly updated to reflect innovations in technology, knowledge gained about playground-related injuries and mechanical mechanisms of injury. The latest update of the handbook was eight years ago in 2010. It is estimated that emergency rooms across the country treat more than 200,000 injuries per year as a result of children using public playgrounds. Bolts on swing set created an entanglement hazard. A play structure is within use zone of swings. Concrete walls are within the use zone of swings. Rot and insect damage in five posts just above the swing's footing. Vandalized and shattered Plexiglas bubble. “Following our inspection, city staff contacted the equipment manufacturer to identify possible solutions,” said Public Works and Development Services Director Gina Hortillosa. Swings and bolts were removed to eliminate entanglement hazards and conflict of concrete walls being in use zones of the swings. However, these measures didn’t fully address the safety issues. Hortillosa and her team conducted a follow-up site visit on June 15th and other issues were revealed. “The swing frame top can be easily accessed from the adjacent play structure and inadvertently used as a nine-foot-high balance beam,” said Hortillosa. Further, rotten wood and insect damage of the footings were identified, which are signs that the play structures are close to the end of their useful lives. Heron Park’s wooden play structures are approximately thirty years old. Hortillosa ordered the immediate removal of the swing set frame following the June 15th site visit. Heron Park users are upset at the removal of the swings, but Hortillosa noted that at this time there is not a practical solution to address the life and safety issues presented by inadequate use zones of the swings. A rough order of magnitude cost estimate for the replacement of the play structure ranges between $125,000 and $325,000. 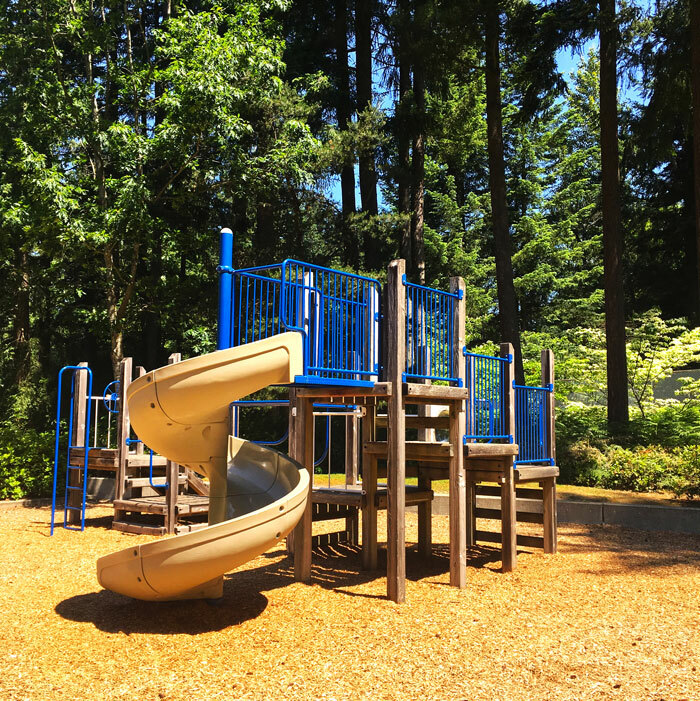 Factors such as play area design, surfacing, and equipment chosen greatly influence the cost. “With the upcoming development of the City’s Capital Improvement Program, staff’s top park project recommendation is the replacement of the play structures of Heron Park,” she said. Plywood plank replacement for plexiglass bubble on Heron Park play structure. Photo credit: Richard Van Winkle.